In France samplers are named " marquoir", "marquette" or "abecedaries. "These were functional rather than creative past-times. Most of the time it was a work to teach young girls cross- stitch embroidery . 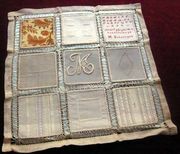 From the age of puberty any girl had to prepare her own bridal " trousseau" and to mark each item with her initials . Cross-stitch embroidery appeared in Europe between the X and the XIII century. Embroidery was an aristocratic pastime. The lady of the manor reproduced motifs from the rugs brought back by their Lord from the crusades. 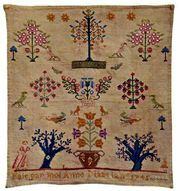 The use of cross-stitch spread in Europe in the XV century and was considered to be something that every young girl should learn. 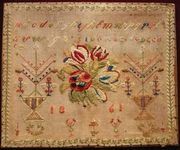 French sampler by Anne Mazelan 1745. 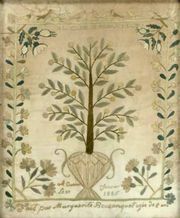 A sampler made by Virginie Grimoux in France in 1848 while she was attending boarding school. The dominant image of the sampler is the boarding school church where you can see the little figure of Virginie standing at the top of the step. Surrounding the church she embroidered multiple representation of flowers and a great variety of little animals, icluding birds, rabbits, mices dogs, lambs, cows, etc. 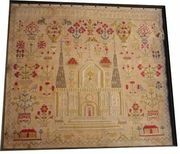 The cross stitch point appeared in france between the X and XII century. The Lady of the manor stitched patterns that their Lord brought back from the crusades. 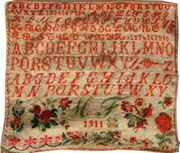 From the XVI century making samplers (marquoir in french) was a way to teach young girls the alphabet letters. Red crossed stitch letters wer used to tag linens. 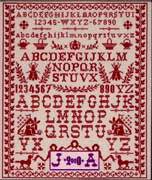 the sampler, or “abcdaire,” was the pride of each little girl who arrived in the adult world. On a swath of cloth, she embroidered in needlepoint the letters of the alphabet as well as the numbers from zero to nine. The initialled letters of the “marquoir,” or the family stamp, were always “blood red,” a symbolic reference of the young girl’s destiny as a woman. Why red? Because red was also a strong and durable dye, resistant to multiple launderings and one that could be easily seen. Before the era of chemistry the colorant widely used was “common madder,” or “rubia tinctorum.” Common madder belongs to the vast plant world family of rubiaceae, quite a remarkable family in that it also includes the plants that produce coffee beans and quinine. A perennial plant, common madder has evergreen leaves, tiny yellow/white flowers and reddish black pea-sized berries. However, it’s in the roots that the pigment is found that is the source of the dye known today as alizarin. Very interesting and unusual embroidery exercises executed by a young girl, Marie Deherripon at Tourcoing in 1898. This work was most likely the showpiece for her "final exam" at the end of her year of sewing class. 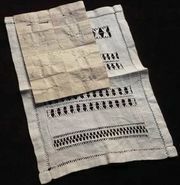 In this piece, as one can see, she assembled miniature examples of the various kinds of stitches that she mastered. A second work of the same type of Marie Deherripon dating from 1898.